Professional tennis player, Billie Jean King, said “Tennis is a perfect combination of violent action taking place in an atmosphere of total tranquillity.” A player must be fast on their feet, think quickly, but also be tactical and do more than just react to the ball. While observers might only see a volley, the two players are actually in a struggle to dominate and crush their opponent. Sweet Spot, designed by Dominic Michael H. and to be published by Medieval Lords, will reportedly be comprised of 40 Return cards, 20 Service cards, 40 Tactic cards, 4 Score cards, 4 Player Aid cards, 6 Avatar cards, and 5 small wooden cubes. As this is a review of a prepublished game, I cannot comment on the game component quality. The illustrations are outstanding, capturing the emotional and sometimes brutal game play as the tennis ball is smacked back and forth with growing ferocity. Note: The set up described here is for a singles game (2-players). See “Game Variant” for a doubles game (4-players). To set up the game, first separate and shuffle the Return, Service, and Tactic cards into their own decks. Place each deck face-down in a row. These are the draw decks for the duration of the game. Second, have each player select an Avatar card or randomly deal them out. The selected (or dealt) Avatar card is placed in front of the player with the Special Power side face-up and at the ready. Return any Avatars not in use back to the game box. Third, each player takes 1 cube and places it on their Avatar card’s “10” value spot on the Stamina track. Fourth, organize and place the Score cards so the number values correctly ascend and descend along a single continuous track. Place a cube to one side. Fifth, either mutually agree or flip a coin to determine which player will serve first. 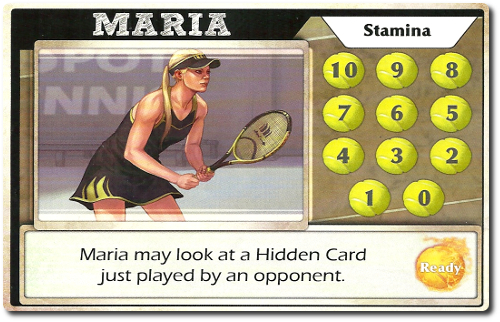 The player who is selected is referred to as the “Server” for the duration of the round and must play Service cards. Sweet Spot is completely card driven. Understanding how the cards work is essential to game play. The different cards and important concepts of the game are summarized here. Stamina is the currency in the game. The harder the player swings or moves around the court, the more stamina it will cost. Stamina is tracked on the player’s Avatar card. Cards cost Stamina to play. If the player cannot pay for the card (due to the reduction in Stamina causing less than zero Stamina remaining), the card cannot be played. As such, the more stamina the player has, the more options they have. Avatars are the tennis pros the players control during the game. Each Avatar card has a Stamina track and a Special Power. Special Powers can only be used once per game. The Service cards are used by the player who is the designated Server for the round. 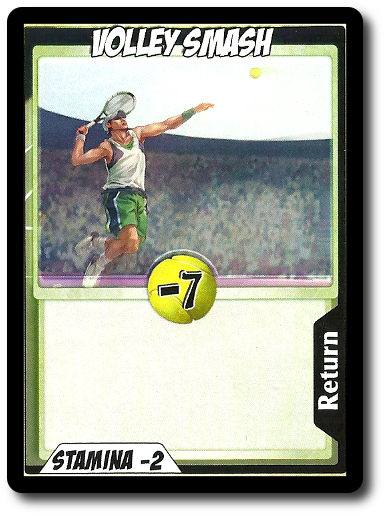 The card has a fixed Ball value, representing the control the player has over the initial swing. 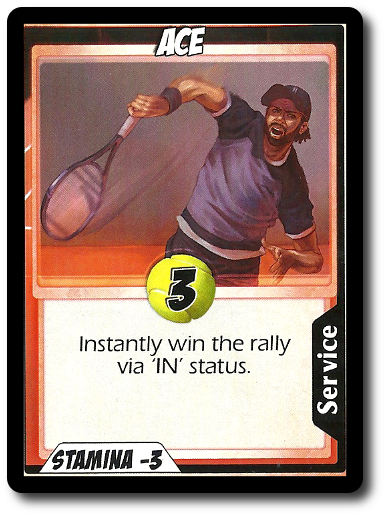 If a player is unable to play a Service card to begin a point rally, they double-fault and immediately lose the current rally. They then draw 2 Service cards. 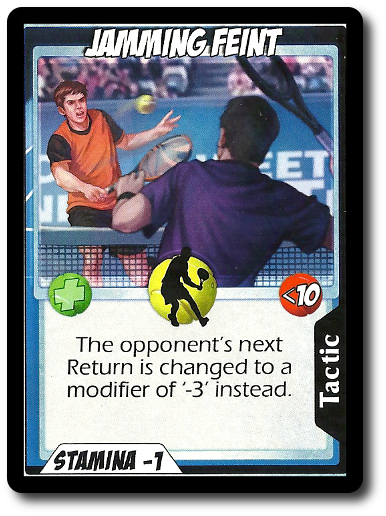 Return cards focus on hitting the ball back to the opponent; however, playing a Return card is always optional. A player can, if they believe it in their best tactical and strategic interest, not play a Return card. This will result in a point being earned by the opponent, but the player saves a Return card in the process. Likewise, if a player cannot play a Return card, a point is earned by their opponent. Tactic cards are a gamble. They attach to other cards and augment the results. Which may or may not work in the player’s favor. Despite the outcome of the Tactic card not being fully revealed until the opponent has an opportunity to react to it, one thing is very certain: Tactic cards are game changers. These are special cards that are played face-down so the player’s opponent does not see them. They are still played like Return and Tactic cards, however, and even look as such except for a special icon that identifies them as hidden (silhouette of a player). After an opponent plays a Return card, the hidden card is revealed and resolved. Sweet Spot is played in rounds for a total of 3 round per game. Each round is comprised of several rallies where the players take turns hitting the ball back and forth to each other. A rally always ends with a point being awarded to one of the two players. Game play is summarized here. The player who is acting as the Server draws 2 Service cards, 2 Tactic cards, and 6 Return cards. The Receiver player draws 2 Tactic cards and 8 Return cards. The Server now plays 1 Service card. The number value on the card determines the cube’s initial spot on the track. The Receiver can now play a Return card if they like. The Return card has a number value that modifies the cube’s position on the track. After the initial service, the only cards that can be played are Return and Tactic cards by both players. The game continues with the cube being pushed and pulled until a player hits the ball out-of-bounds or a point is scored. The rally ends when a point is scored by either player. Some cards can be played after a rally and both players may discard cards before the next rally begins. Before the next rally does begin, players draw back up to 10 cards each. After so many points are earned, the round comes to an end. Each player regains 4 Stamina and can select 2 cards to keep that move to the next round of game play. A new round then begins after drawing cards based on role (Server or Receiver). The game ends after 3 rounds of play. The player who won the most rounds wins the game. Sweet Spot can be played as doubles, meaning up to 4 players can enjoy the game at a single time, with 2 teams comprised of 2 players each. Game play is very similar with a few exceptions. For example, teams can decide who gets to serve and players must take turns returning the ball. 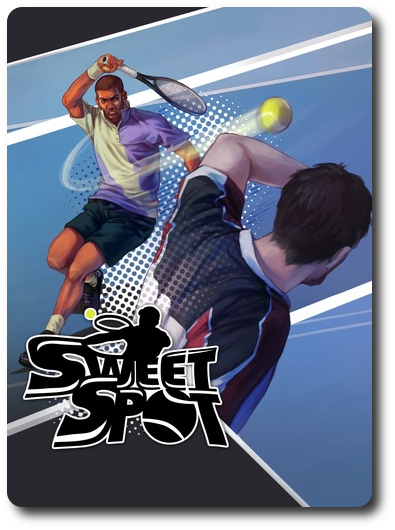 To learn more about Sweet Spot, visit the game publisher’s website or visit the Kickstarter campaign. The Child Geeks loved the back-and-forth game play right from the start. According to one Child Geek, “It’s like a game of one-upping each other. It does feel a lot like tennis, but not in the sense that I am swinging an actual racket.” Another Child Geek said, “What I like most about this game is trying to not only return the ball, but return it in a way that your opponent cannot send it back to you.” The Child Geeks were surprised how much thought they had to put into their turns and always had a look of smug satisfaction when they smacked the ball so hard back to their opponent that it could not be returned. To quote my oldest son, “THIS IS MY HOUSE!”, to which I had to remind him that it was indeed his home, but I paid the mortgage. He toned it down after that. One aspect of the game play that never let up was the overall enjoyment had by the Child Geeks, resulting in a full endorsement by the younger gamers. The Parent Geeks, like myself, were very happy with the game’s level of depth, speed of play, and intensity. According to one Parent Geek, “A fast game that has a lot more going on than I originally believed. I’m really enjoying it.” Where the game shined the brightest was when the Parent Geeks played doubles with either a peer or with a Child Geek. As one Parent Geek put it, “Doubles is the way to go. The ability to partner with someone is a lot of fun and you can work out some really interesting combos, setting each other up.” The only aspect of the game the Parent Geeks didn’t care for was some of the rules that were a bit vague at times to help determine the proper handling of some cards and recording points. None of which were terribly difficult to think through, however, and the games were never held up. When the last ball was put away, the Parent Geeks all voted to approve Sweet Spot. The Gamer Geeks were surprised and delighted at how fast the game was played and the level of tactical and strategical thought it took to out play their opponents. According to one Gamer Geek, “Now this is a tennis game. Sometimes you can only return the ball because of positioning and other times you put the ball right where you want it, either setting up for another great hit or attempting to unbalance your opponent. This game has all that.” Another Gamer Geek said, “This is one of the better Sports games I have played in a long time. It feels fast, frantic, and energetic.” The Gamer Geeks found the singles match to be fun, but really enjoyed the doubles, too. Like the Parent Geeks, they liked playing with a partner so as to allow them to set up combos and play off each others cards. When the games were over, all the Gamer Geeks agreed that Sweet Spot really did hit the mark and it was a game they’d gladly play as a filler at their elitist gaming table. I was certain that Sweet Spot was going to feel like Tug-O-War, but I was very pleased to discover it felt nothing like that at all. What it does feel like is something similar to bulls-eyeing a sniper shot. The game is aptly titled. There really is a “sweet spot” the players are going for, adjusting the ball value up and down until they have it exactly where they want it. This same type of game play is found in the real game of tennis, where players steadily move into position for a powerful backhand or slamming forehand. After playing the game once, you’ll quickly realize that Sweet Spot is a game of subtle manipulation, resource management, and cracker jack timing. Every card costs a little bit of stamina and a player must bide their time to find an opening. This forces a player to continue to use their stamina when they really don’t want to. I lost a point a number of times because I was unable to find an opening, wherein my opponent simply outmaneuvered me. Other times I found the “sweet spot” almost right away and let my opponent have it with my most powerful (and stamina expensive) shot. But perhaps best of all, the game takes into account a brief period of rest between sets, allowing each Avatar to rest for a short period of time. The game is not reset by any means. Rather, it’s a continuation of the previous set, but now both players know a bit more about their opponent, their style of play, and possible tactics. It’s a lot of fun, feels strangely like a duel, and challenges you to think critically from the very first swing to the very last point. If you like tennis, you’ll certainly feel at home with Sweet Spot. Even if you don’t know the first thing about tennis, you’ll quickly understand the basics and jump into the game with the confidence of a master. Sweet Spot is fast and fun, nail-biting and frustrating, tactical and strategic, and best of all, satisfying. Do give this game a try. Tagged Card Games, Cooperative Games, Prepublished Games, Sports Games. Bookmark the permalink.